Interval training consisting of brief high intensity repetitive runs (30 s) alternating with periods of complete rest (30 s) has been reported to be efficient in improving maximal oxygen uptake (V˙O2max) and to be tolerated well even by untrained persons. However, these studies have not investigated the effects of the time spent at V˙O2max which could be an indicator of the benefit of training. It has been reported that periods of continuous running at a velocity intermediate between that of the lactate threshold (vLT) and that associated with V˙O2max (v V˙ O2max ) can allow subjects to reach V˙O2max due to an additional slow component of oxygen uptake. Therefore, the purpose of this study was to compare the times spent at V˙O2max during an interval training programme and during continuous strenuous runs. Eight long-distance runners took part in three maximal tests on a synthetic track (400 m) whilst breathing through a portable, telemetric metabolic analyser: they comprised firstly, an incremental test which determined vLT, V˙O2max [59.8 (SD 5.4) ml · min−1 · kg−1], v V˙ O2max [18.5 (SD 1.2) km · h−1], secondly, an interval training protocol consisting of alternately running at 100% and at 50% of v V˙ O2max (30 s each); and thirdly, a continuous high intensity run at vLT + 50% of the difference between vLT and v V˙ O2max [i.e. vΔ50: 16.9 (SD 1.00) km · h−1 and 91.3 (SD 1.6)% v V˙ O2max ]. The first and third tests were performed in random order and at 2-day intervals. In each case the subjects warmed-up for 15 min at 50% of v V˙ O2max . 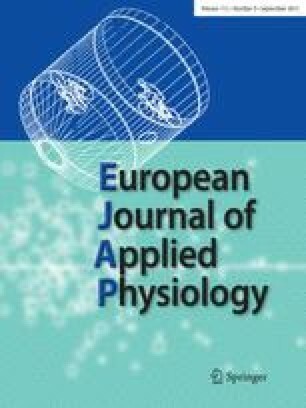 The results showed that in more than half of the cases the vΔ50 run allowed the subjects to reach V˙O2max, but the time spent specifically at V˙O2max was much less than that during the alternating low/high intensity exercise protocol [2 min 42 s (SD 3 min 09 s) for vΔ50 run vs 7 min 51 s (SD 6 min 38 s) in 19 (SD 5) interval runs]. The blood lactate responses were less pronounced in the interval runs than for the vΔ50 runs, but not significantly so [6.8 (SD 2.2) mmol · l−1 vs 7.5 (SD 2.1) mmol · l−1]. These results do not allow us to speculate as to the chronic effects of these two types of training at V˙O2max.